Last evening, Officer Nick Eull and K9 Frees were dispatched to assist with a weapons offense investigation. What had started out with two juveniles physically fighting in a nearby park escalated into a stabbing. After the initial fight was over, the juveniles involved returned to the 6700 block of Schroeder Road to continue the fight. During this altercation, the suspect stabbed the victim once in the back. The victim was transported to the hospital for treatment of his non-life-threatening injuries. The suspect was arrested on scene without the weapon used in the attack. Officers on scene were able to determine an area that the weapon was likely discarded by the suspect. Officer Eull and K9 Frees were called to attempt to locate this key piece of evidence. Our patrol K9s are trained to locate evidence. They do this by sniffing an area for an object or objects that contain human odor. 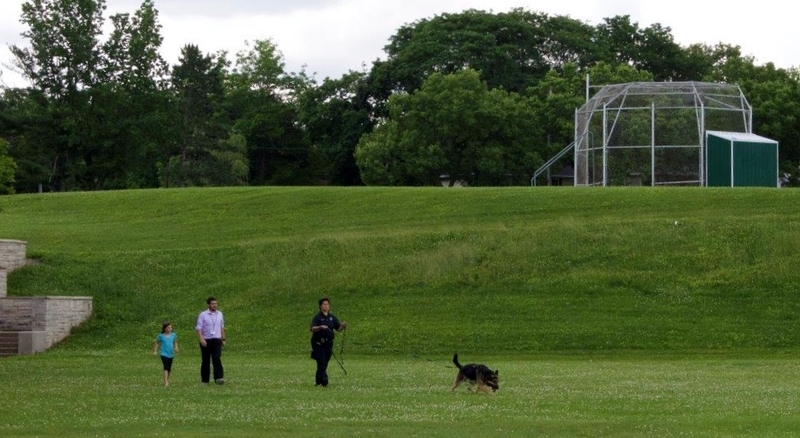 In K9 Frees case, the weapon had been tossed into a large, thick, heavily vegetated area. 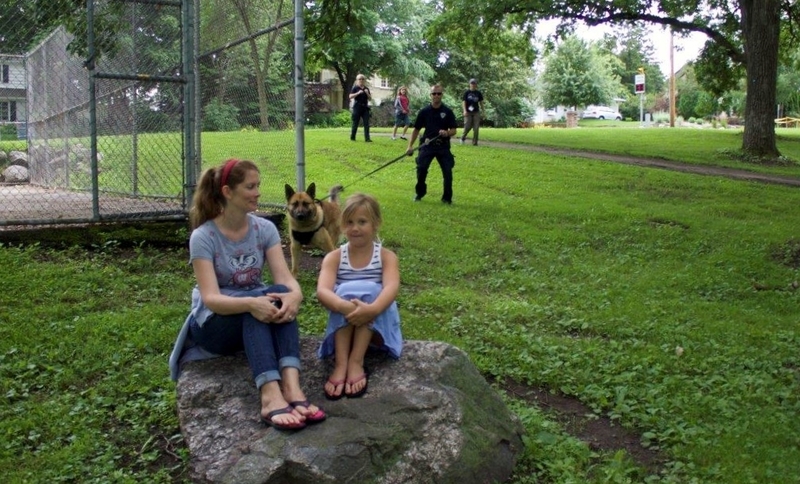 As dusk was falling, Officer Eull had K9 Frees begin sniffing the area in question. They began on the downwind side of the area, as this helps carry scent to the dog. In short order, Officer Eull recognized K9 Frees change of behavior as Frees began working a scent cone created by the object. K9 Frees worked to the source of this scent, alerting on the weapon used in this violent attack. K9 Frees was able to locate this weapon, which was also laying under some vegetation, in about three minutes. Great work by this team and another example of how our K9 partners compliment the work we do every day. 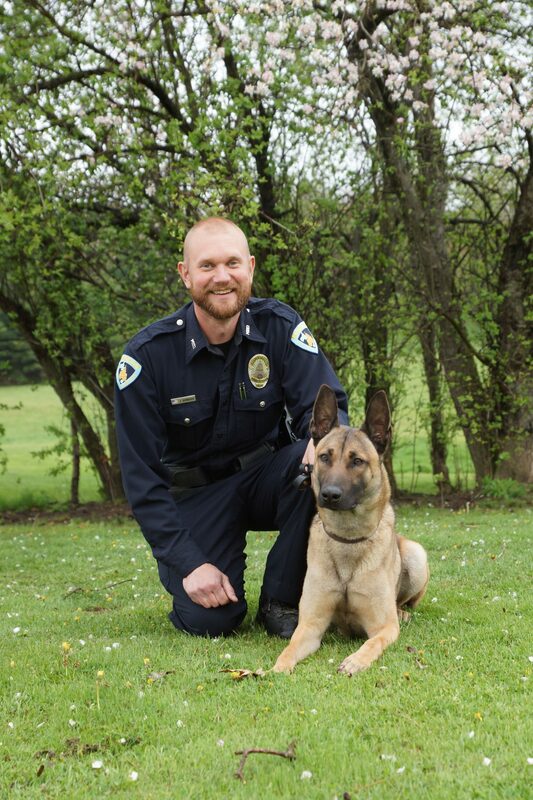 Officer Jason Baumgart and his K9 partner, Allied, just recently graduated from their 6 week handlers course and another week of in-house training before “hitting the streets.” The team has already had a couple of noteworthy cases in less than two weeks of working in patrol. The team was utilized for two separate cases of suspected drug trafficking. The first case required K9 Allied to sniff a vehicle. K9 Allied alerted on the vehicle where illegal drugs were recovered. A search warrant for the suspect’s apartment was also executed. K9 Allied was utilized to sniff the apartment where additional illegal drugs were located. In all, heroin, cocaine, marijuana, and cash were seized during this investigation. 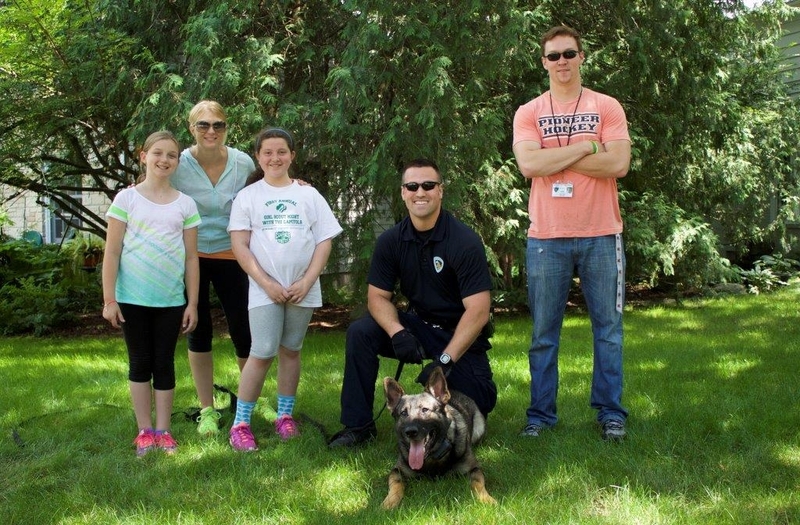 Less than a week later, Officer Baumgart and K9 Allied were called to another traffic stop. K9 Allied sniffed the exterior of the vehicle, alerting to the odor of illegal drugs in the van. This sniff allowed a subsequent sniff and search of the vehicle’s interior where a kilo of cocaine was located hidden in a container. 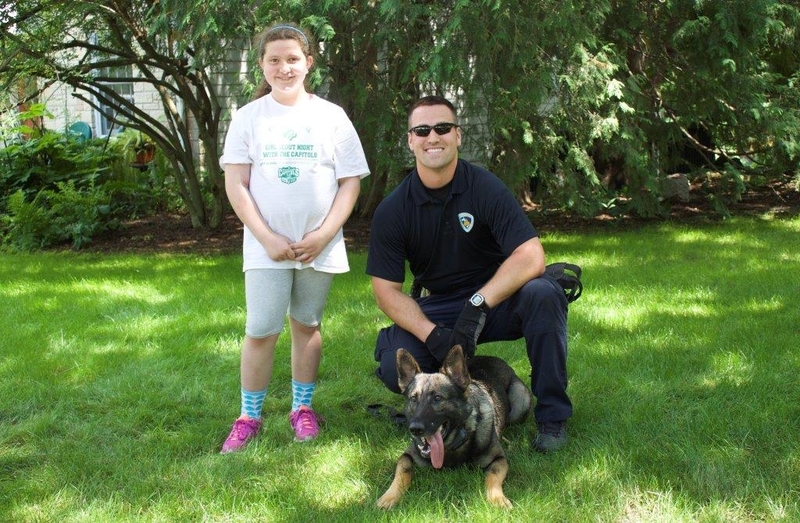 Officer Baumgart and K9 Allied’s impact are already being felt. Officer Baumgart and I continued our training this last week with our K9 partners, Allied a nd Carl, respectively. We continue to progress in our training. Our training week began with searching in a working jail. We both did searches, Carl and I searching for explosives, and Allied and Jason searching for illegal drugs. The dogs did very well. This is important for the teams to experience, not only because we’re searching a different type of facility, but for the environmental factors as well. We had to go through the security process with the dogs. We had to wait, to be “buzzed in” to the secure areas. The dogs also had to ride elevators, which was for many I’m sure the first time they experienced this. After completing the morning in the jail, we moved onto working in a school. 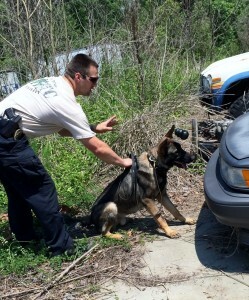 We did more searches, with Jason and Allied also working on building searches that are meant to replicate a burglary. 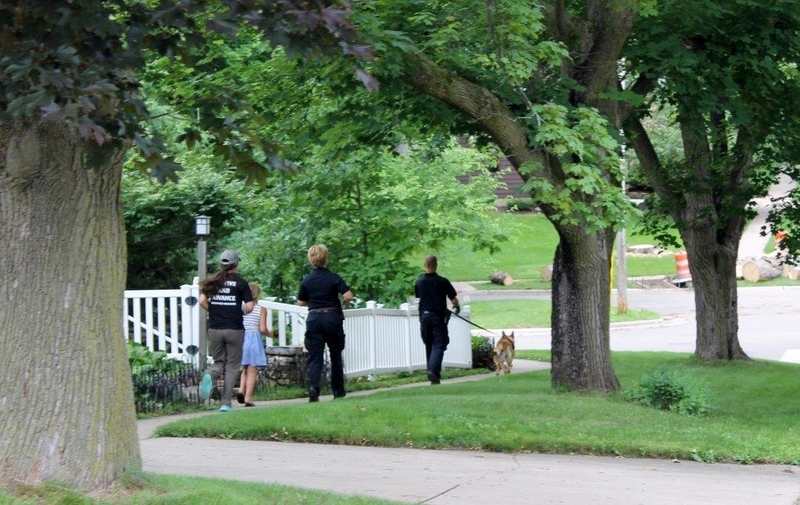 The searches are still simple and relatively quick as the dogs learn what’s being asked of them. This will progress to the point where a well-trained dog is capable of methodically searching a burglarized building with little verbal communication with the dog and handler. The dogs can learn to search and “down” (lay down with a command) with hand signals which allows us advantages from a tactical standpoint. Carl and I continued to do many different types of explosive searches. He’s now searching the wing of a school and larger and more challenging areas. To think we started a few short weeks ago working in a small room. His progress and aptitude have been amazing. I’m also getting better at what I do. The search for illegal drugs (which I did with my former K9 partner) and the explosive search patterns are quite different, which makes sense for obvious reasons. For many of our explosive searches, they will begin on the outside of the building-clearing the outside before we clear a doorway to make entry into an area. Our searching has to be methodical and disciplined. With my old K9 partner, it didn’t matter if he wanted to jump up on a file cabinet to sniff for drugs. Very different with an explosive detection dog. You don’t want the dog jumping on anything!! Also, if I haven’t mentioned before, both dogs are trained for passive alerts, which means they sit or lay down as close to the source of the odor as they can. There are aggressive alert trained dogs which means they scratch at the odor source, again not a good quality for a bomb detection dog. Our training progressed so well, Carl and I were able to return home this weekend after four weeks of training. Officer Baumgart and Allied, because they are dual purpose and have so many more disciplines to be proficient in, will be training for two more weeks. The two are doing very well. They’re often training in another area from where I’m training, but we did have a few opportunities to work together this last week and the two have clearly bonded and complement each other well. 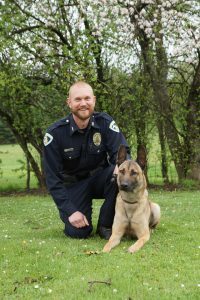 They’re continuing to progress on their tracking (longer and more aged tracks), narcotics searches, obedience, and bitework. We’re certianly looking forward to having them home soon! 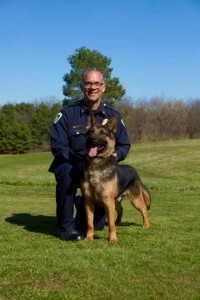 I’ve attached a “graduation” picture of Carl and I. I left out the “action shots” of him jumping on top of me….If you look closely, you might see a paw print or two on my uniform. He’s a great dog with a big personality-a joy to work with. Thanks for following our progress. 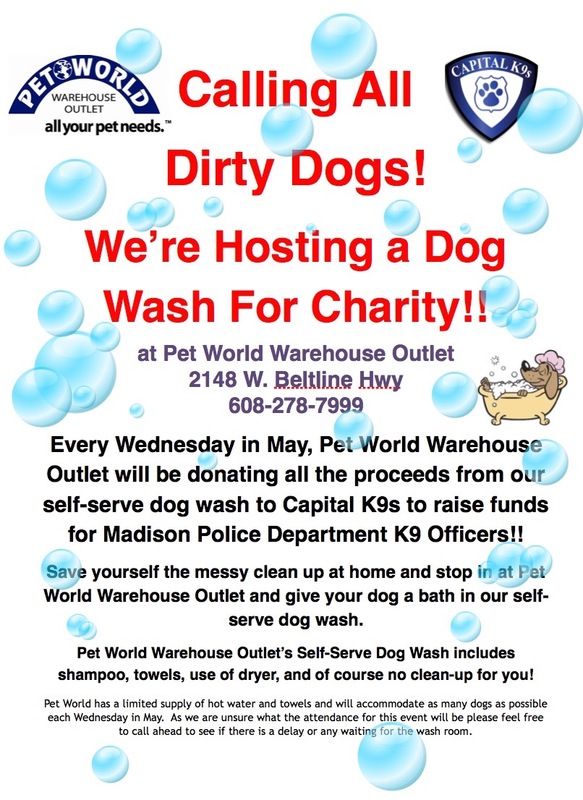 All funds from the in-store dog wash ($15 per dog) will be donated to Capital K9s. Officer Baumgart and I continue to progress in our training with K9 Allied and K9 Carl. 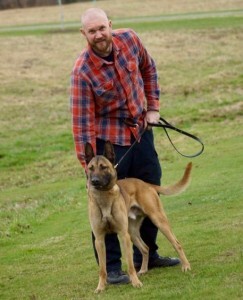 As I’ve mentioned, the training continues to build for both the handlers and the dogs. Much progress was made this week and there is much more to learn! I’m not sure exactly what the weather has been like at home, but I can assure you, this area of Pennsylvania and Ohio where we are working and staying has certainly made me feel right at home (yes, multiple days of snow, cold weather, and huge temperature swings-sometimes within the hour). This past week, on Monday, we started our training at the fairgrounds. We worked on tracking during the morning. 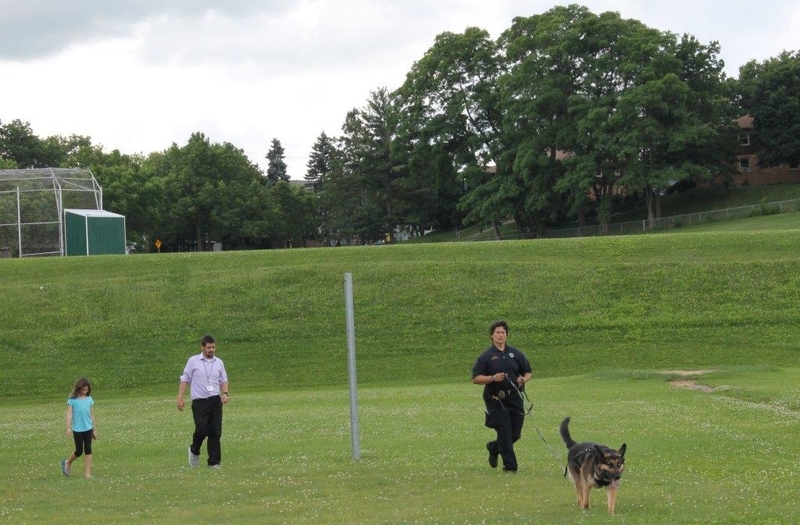 The dogs are now working on increasing the distance of the tracks and working into the tracks. This means instead of starting at the beginning and going forward (following the track as laid), the dogs are started perpendicular to the track and worked toward the track. They get to the track and have to pick a direction. Again, this is channeling their genetics (drives) to hunt and find food. In the wild, they would come across a track. If they track the freshest direction, they are rewarded, potentially, with a meal. If they track the other direction, older part of the track, they don’t eat. As the week progressed, the tracks are getting longer in length and are beginning to be “aged”. Instead of a fresh track, the dogs are now tracking 20-30 minute old tracks. We also did scent detection at the fairgrounds. It was windy and cold, but we searched large sections of bleachers, a challenge for the dog and handler (figure out a pattern that works for both). You work downwind and work into the wind on your search pattern. The scent you’re looking for produces a scent cone, that’s influenced by the environment, but eventually the dog will reach that scent cone and work right to the source (narcotic or explosive). It’s amazing to watch. Tuesday and Wednesday we did “certifications.” This involved all of the disciplines we’ve been working on, but were done as testing. Most of the searches we do are all unknown to us. The teams are put through a series of tests by an independent certifying agency. In this case, this was a mock test by the trainers of Shallow Creek Kennels. However, before we leave there will be an independent certifier to test the dogs on all aspects of their training. 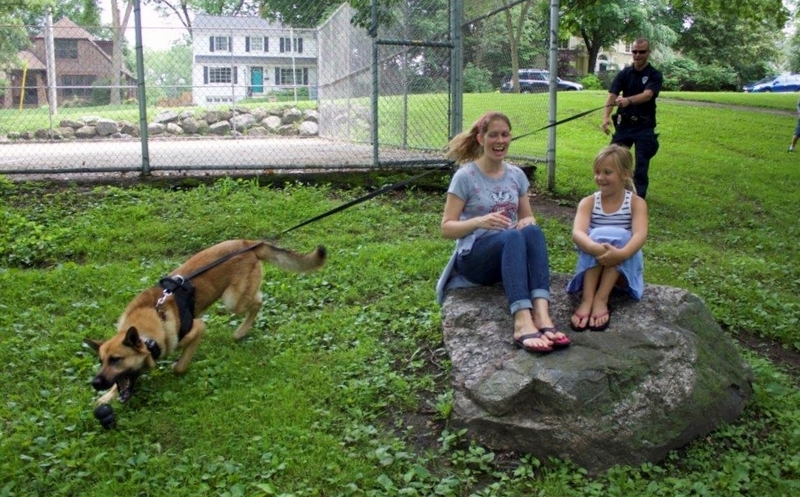 All of our dog teams in Madison are certified annually by the North American Police Working Dog Association (NAPWDA). The certifications were done at a large high school, where the dogs sniffed lockers for the first time, and at the auto salvage yard. Carl and I did our first long line search (on a 15 foot leash), where he was out in front of me sniffing a row of cars. We worked on the downwind side of the cars. There were 12 cars for him to sniff and he quickly found the two that had explosives in them. 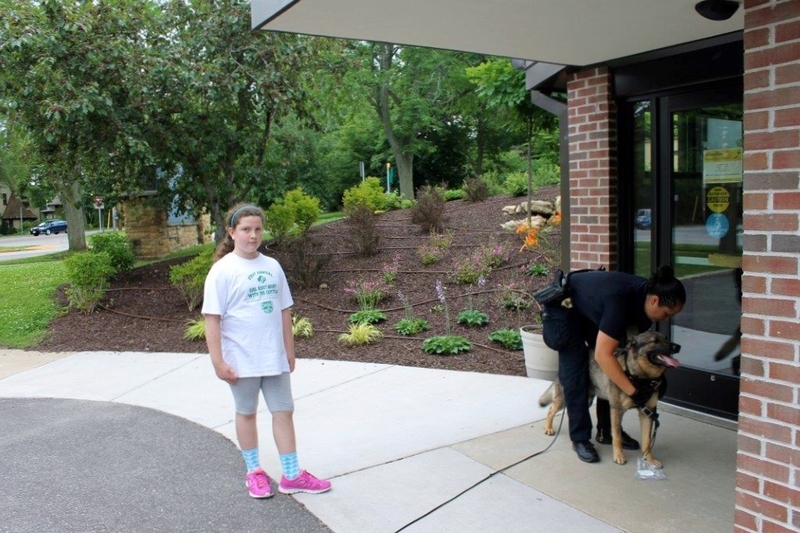 Thursday we were at a large mansion working on searches, obedience, and other environmental factors. For example, the dogs have likely not been exposed to large, open, metal stairwells. There is a two story stairwell like this attached to the building. We took our dogs up and down this several times until they were comfortable. The same holds true for dark, narrow stairwells. We’ve done that several times with the dogs. These are environment factors they will experience as they are doing patrol work. Officer Baumgart and K9 Allied also starting doing building searches. The dogs have the ability to locate a suspect inside a building, whether or not they are exposed. If the suspect is hiding behind a door, for example, the dog will sniff the door and bark, letting officers know that the suspect is there. Friday, we did tracking during the morning hours. Over the lunch break, we were visited by a K9 officer from a nearby agency who had recently lost his K9 partner to gunfire–the dog was killed by a burglary suspect while they were clearing a business that had been broken into. He talked about the details of the call, everything from the tactics he used, things he would do differently to treating his partner after he’d been shot. The presentation was emotional and humbling. A reminder of how these amazing animals help keep us all safe with their selfless service. The officer or officers would have likely been shot by the suspect, but the dog located him first (this was a “routine” burglary call-no idea the suspect was armed with a gun). Also, a reminder for us that there are no “routine” calls. The afternoon consisted of more building searching for Officer Baumgart and Allied. Carl and I learned how to search luggage and packages. It was another busy week of working and learning. Three weeks are in the book. We’ll keep you posted on our progress. Thanks for reading and supporting our unit! Our second week of training continued to build on the foundation of the first week of training. In addition to the obedience and searches (explosives and narcotics), we began tracking people. Carl and Allied (and their handlers) had a busy week. To give you some examples of these different disciplines and the training progression, I’ll start with obedience. The first week, we worked on basic heeling (the dog walking on your left side), having the dog sit and stay down, stay in their respective positions as you moved out in front of the dog. There was also obedience with another dog on the field at the same time with you. This week, the dogs worked on all of these previous skills and also “downing” while we continued to walk. 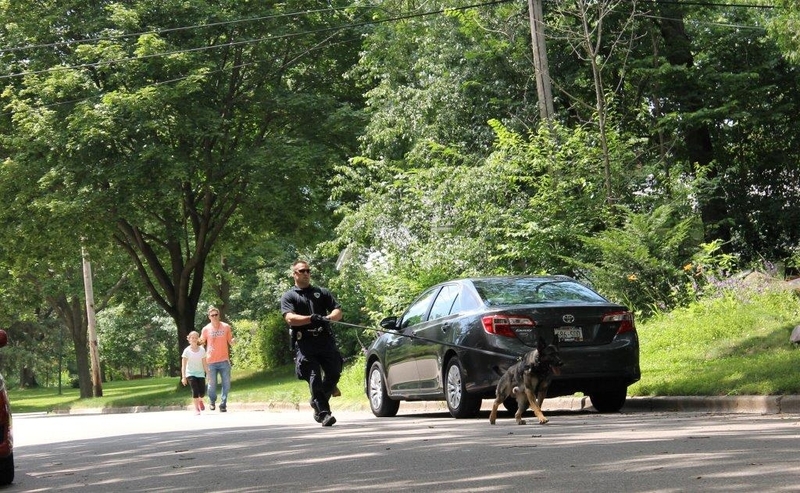 The dogs were also exposed to more distractions (gunfire, for example) and were taken through a series of commands without the handler having the leash. The searches are increasingly challenging and more complex. For Carl, his explosive searches involved more rooms and larger rooms. One of his searches involved a series of ten rooms, several of the rooms contained no explosive training aids. The searches are unknown to me. I have to focus on my search patterns, watching him work, listening to his breathing patterns, and recognizing when he begins to work the odor of an explosive. I’m also trying to move quickly through the search area focusing on areas that are likely to contain an explosive. There’s a lot to process very quickly. I’m improving, but have a long way to go! Officer Baumgart is having a similar experience with his narcotics searches with Allied. He’s moved to several different locations, inside and outside. The two of them are searching buildings, rooms and vehicles. One of the locations we both went to this week was a large auto salvage yard, containing hundreds and hundreds of vehicles. We were required to search different sections of the yard and locate our respective explosive or narcotic finds. We both also began tracking. We are doing relatively short tracks of people. The longest track is 50-75 yards with a couple of turns. Much of this week for us is getting comfortable with preparing the dog to be successful on the track. This preparation includes bringing them up to the track (giving them an idea of what they are doing, smoothly putting on their tracking harnesses–easier said than done) and running the track. You have to make sure the dog has engaged the track and then use great leash discipline on the track. 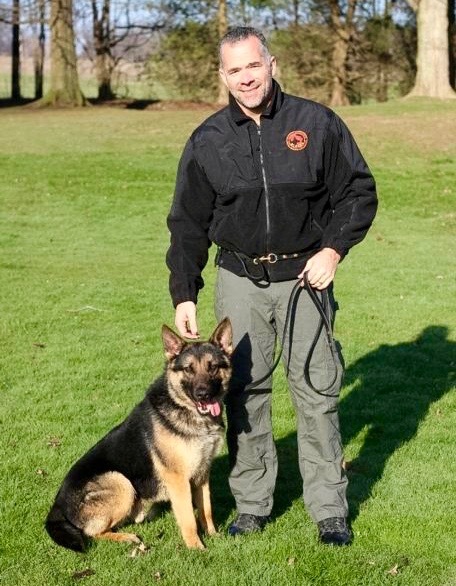 Officer Jason Baumgart and I are currently at Shallow Creek Kennels, Sharpsville, PA, going through a six week handlers course getting the Madison’s Police Department’s two newest canines, Carl, a single purpose bomb dog and, Allied, a dual purpose patrol dog. This is Officer Baumgart’s first police dog. This will be my second police dog, but first explosive detection dog. The class began last Monday, March 20th, and will conclude Friday, April 29th. There are 15 other handlers from all over the Midwestern and Eastern part of the country here for the course and their dogs. The first two days of class were spent in the classroom, learning everything from the history of your breed of dog, to principles of training, to genetics and drives, to first aid and recognizing symptoms of different ailments the dog may have and treatment for these various problems. Written tests on covered subject matter are administered each Friday. Before we first worked with our new partners, we practiced and practiced “dry runs” on automobiles, buildings, and obedience. We worked on search patterns, to help make the transition a bit smoother when we began working with our dog. Needless to say, things haven’t always gone smoothly and all of this is under the guidance of a trainer. We receive constructive feedback on everything we do, from leash holding, to footwork, to the tone of our voice when giving commands or praising our dogs. The training is challenging and rewarding. The remainder of the week was spent working on narcotics searches for Officer Baumgart and explosive searches for me. 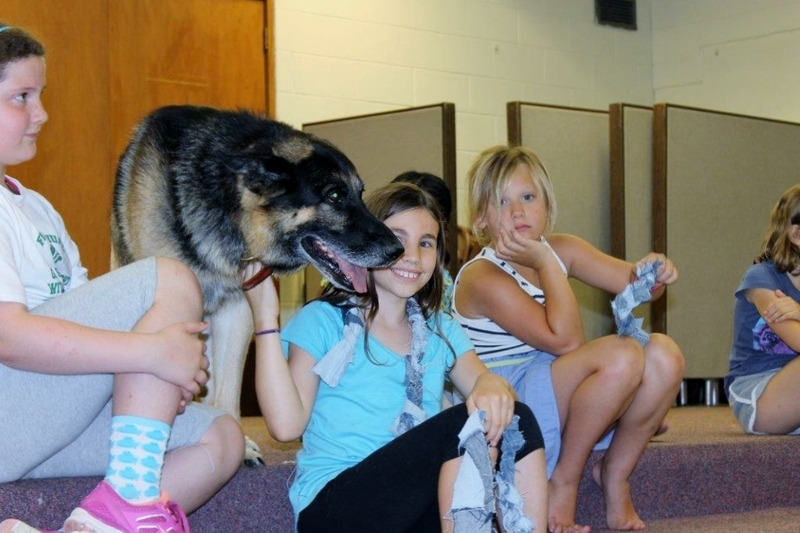 We both also began working on basic obedience with our partners. One of the challenges I’ve had is my former partner’s commands were in German, both of these dog’s commands are in Dutch. I’ve inadvertently given several German commands–too much motor memory. I’m trying to get better every day! Jason and I will try and provide a weekly update of our progress and experience. All of the training was on-site this week. Next week, we’ll be traveling to other venues to expose the handlers and the dogs to different environments and challenges. We’ll be working on other aspects of our training, building on the foundation of this week. We’re looking forward to it! 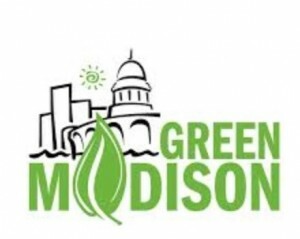 Green Madison is an effort to reduce energy consumption in the City of Madison. 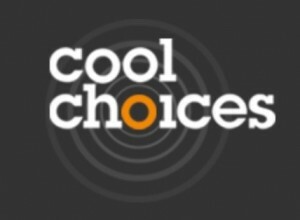 In its first round of an online sustainability game, Cool Choices, concluded in late November achieved cost savings, energy reductions and special recognitions for participants. The online game is part of Green Madison’s city-wide effort to reduce energy consumption and win the $5 million Georgetown University Energy Prize. More than 850 individual players from over 45 Madison businesses and organizations signed up for the 8-week game. Players formed teams and competed to take the greatest number of sustainable and energy-saving actions. At the conclusion of the game the top three individual players were each awarded a grant to donate to the non-profit of their choice. These grants were sponsored by the Madison Metropolitan Sewerage District and Madison Gas & Electric. 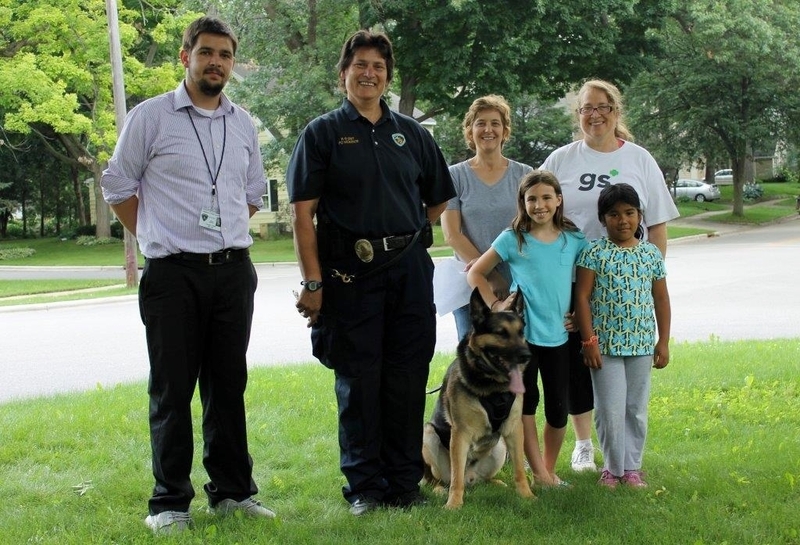 First place winner, Heidi Fleegel, donated her winning grant of $500.00 to Capital K9s, the non-profit organization that raises funds to support the Madison Police Department K9 Unit. “I took part in the Cool Choices game to be more conscientious of making better choices (no matter how small) to help the environment. It was exciting to take first place and learn that I’d won the opportunity to donate a Green Madison grant to the non-profit of my choice. It’s a good example of how a simple game can create positive ripples in the community,” said Heidi Fleegel, City of Madison Records Clerk. 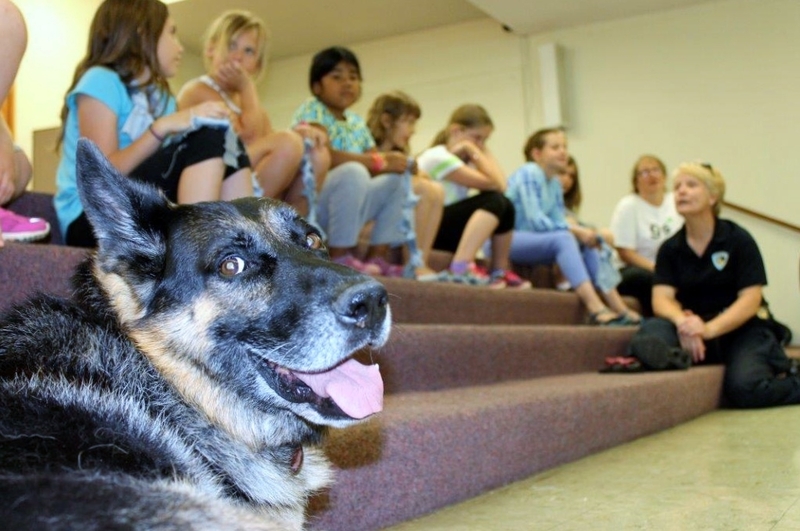 Thanks for your support of Capital K9s! AppleWood Self Storage provides storage and training opportunities. Training at his two facilities involves hiding drugs in empty storage units. 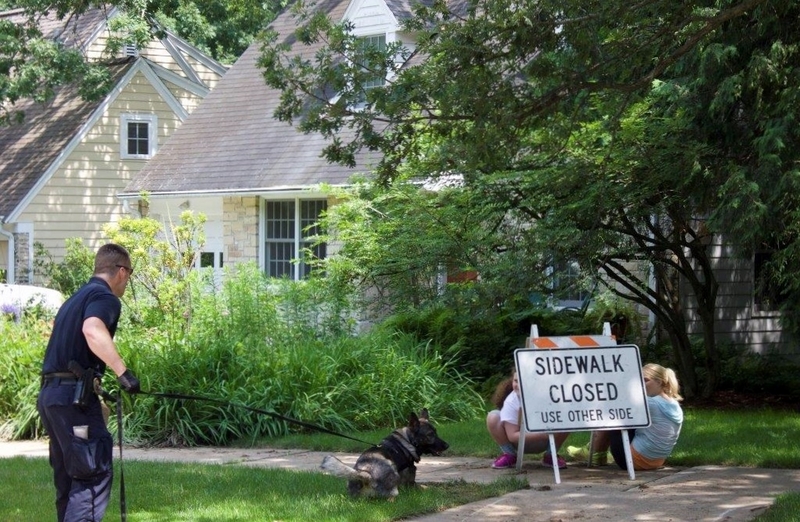 According to the Madison Police Department, the dogs search for these illegal substances by attempting to detect their odor through closed doors. Other storage facilities have requested random checks from the Madison Police Department. Drugs have never been detected in rented storage units at the Applewood Self Storage facilities. This arrangement creates a win-win situation. 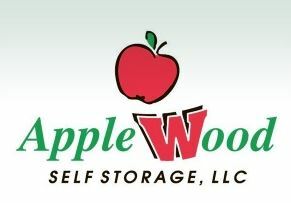 According to owner David Wood, AppleWood Self Storage enjoys “the best occupancy levels” and the Madison Police Department canine unit is provided a quality storage and training venue. Capital K9s thanks AppleWood Self Storage for this valuable service to the community. This report was compiled by Sgt. Chris Boyd of the Madison Police Department K9 Unit. 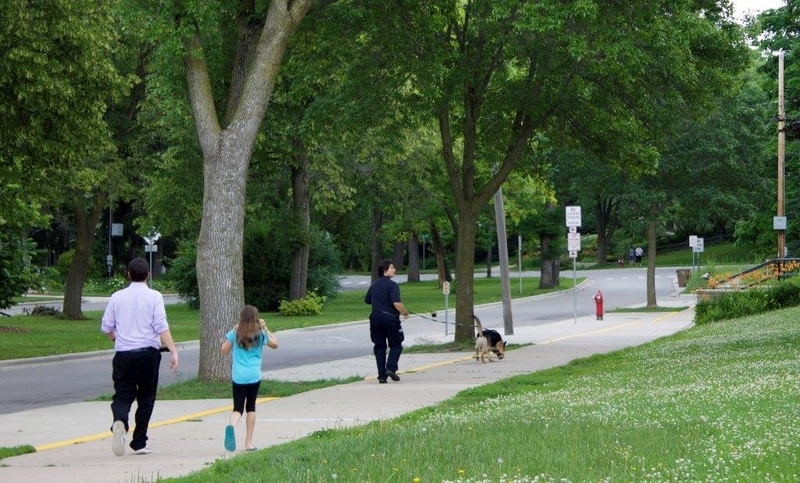 The photos in the slideshow below are from the MPD K9 Unit training conducted on June 29, 2015. 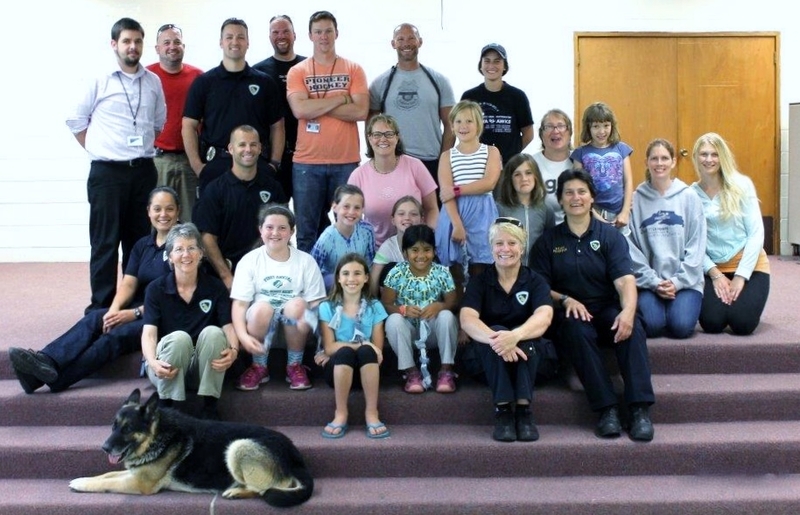 “Our K9 Unit along with Oregon PD K9 and Green County K9 worked with a Brownie troop of 8 girls to better train the K9s to track missing children. 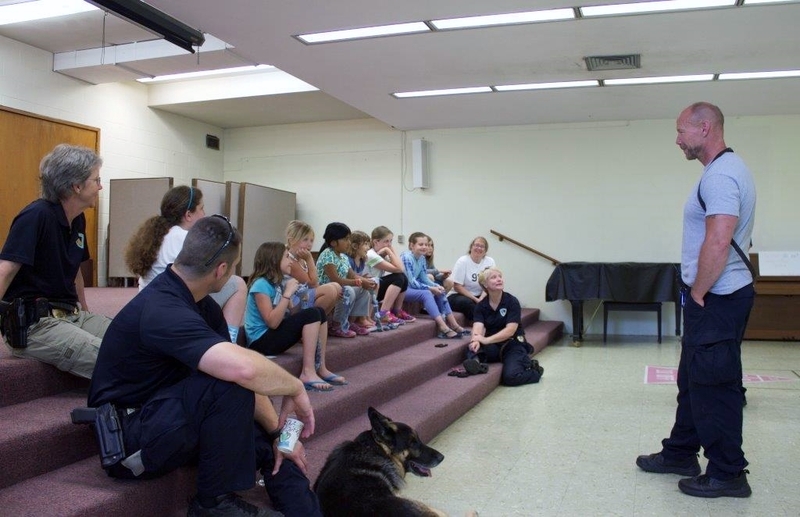 The K9s practiced tracking a specific child in a busy neighborhood and the kids learned how the dogs use their noses to find individual people. 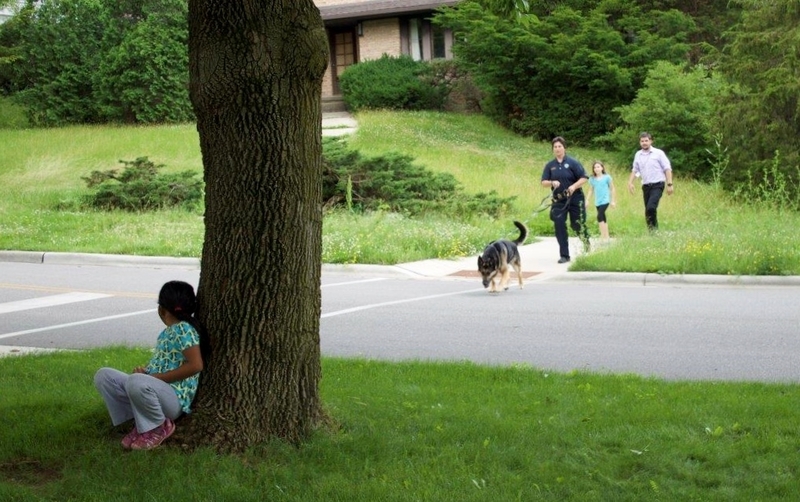 Each of the eight K9 teams tracked two different children a few blocks starting at Westminster Church on Nakoma Rd. 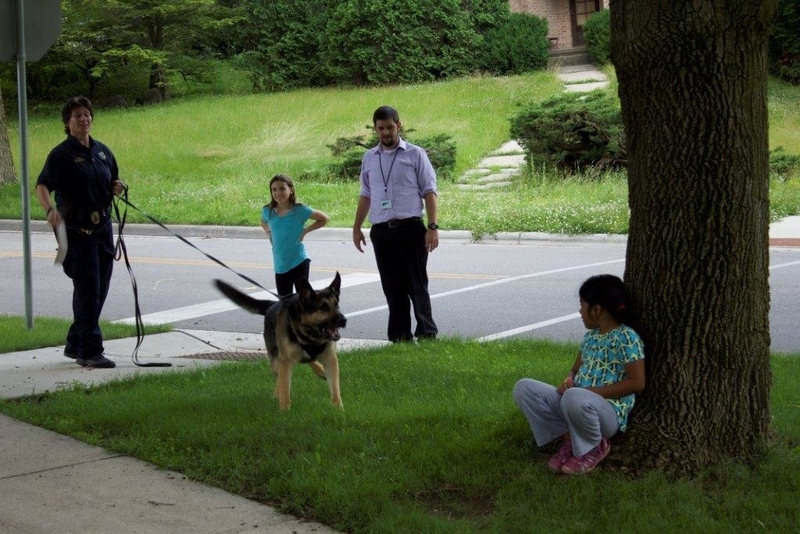 Each girl was able to follow the tracking team while they worked and walk a path to be found by the K9.